I've spent years in sales, sales management, general management or CEO roles with a focus on law firms and corporate law departments. I've also worked on the buyer side leading business development efforts for a global law firm. Over the years I've made every sales mistake possible, and if I've missed any my team or my competition made up for it! Now, as part of my consulting practice I advise law firms and legal vendors on how to improve their business development and sales efforts. With this in mind, the ILTA 2009 conference team asked me to present a session for legal vendors on selling to law firms in a tough economy. I've written previously that some of us have been fortunate beneficiaries of high demand for what we offer, and as a result we have generated successful results, even if our sales efforts are not particularly effective. 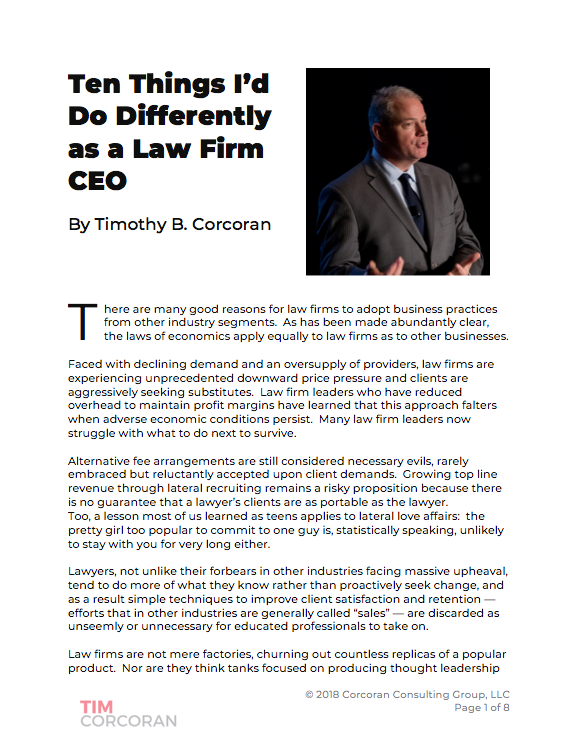 As I walk the exhibit hall at legal technology conferences and trade shows, I see as many examples of poor salesmanship as I see of excellent consultative selling. So as I considered what to present, it occurred to me that a tough economy is a good time to get back to basics. Below is a brief list of back-to-basics sales techniques that every legal vendor should review and embrace. Savvy readers will note that I have previously offered some of these suggestions here or on Twitter. 1. Have an elevator script. And practice it. Don’t assume recognition of our brand equals intimate knowledge of our offering. If we can’t succinctly articulate what we offer, imagine the challenge our prospective client will have when explaining our offering to his decision makers. 2. Define our value proposition by what benefits we offer and what problems we solve, not by how we compare to the competition. 3. Focus on benefits, not features. Features are what our product does. Benefits answer the question, “So what?” Let's seek to know what benefits the prospective client will derive from our offering. Also let's seek to understand what it will cost her if she’s unable to meet this need. 4. Consultative selling involves asking questions so we can customize our offering to the prospect’s specific needs. We need to learn how to ask open-ended questions and actively listen to the responses. And let's not start and stop with the tired, “What keeps you up at night?” We can be more creative than that. Plus, until we've developed rapport and credibility, the client won't trust us enough to share their deepest, darkest fears, uncertainties and doubts. 5. Don’t lead with discounts. Ever. The only message we send is that our offering is a commodity differentiated primarily by price. We can always offer a discount later. Too many vendors create our own price wars by focusing on price too early in the conversation. 6. Seek to understand the prospective client’s total cost of ownership. What other costs will he incur for implementation, retraining, configuration, etc.? What savings will he experience in reduced maintenance, faster throughput, less downtime? Let's position our product in context of the total cost, not as a stand-alone item. 7. If you promise to follow up, then follow up. Every salesperson promises to call, but few do. Seriously. Many of us use avoidance actions like sending emails, letters, and now Twitter DMs, but nothing replaces a live conversation with a prospect. 8. If you rearrange the letters in persistence, you get sincere pest. Persistence is a desirable trait, but let's not become annoying. Each prospect may require a different approach – some want a call back but are busy; some truly delegate decisions to subordinates; some really are avoiding us. Learn to tell the difference. Knowing when to walk away is not just good business sense, it’s also good for the ego. Yes, we may let one slip away, but generally speaking the opportunity cost of endlessly chasing everyone outweighs the benefits. 9. A sales manager known to be a “savior” is often more trouble than he’s worth. If you have to personally close every sale, then let's save money and get rid of the salespeople. Or let's get rid of the sales manager and find one who can train people how to properly sell. And there’s nothing worse for morale than a sales manager who swoops in at the last moment to seal the deal by including a discount that the salesperson isn’t authorized to offer. We don’t need a sales manager for this; someone less expensive in Accounting can perform this role. 10. Memorize this phrase: “I don’t know but I’ll find out.” This is a salesperson’s best friend. A salesperson who believes that she must invent an answer when she doesn’t know the answer merely perpetuates the myth that salespeople are ill-informed hucksters. We demonstrate credibility by promising to find the correct answer – and this also gives us a valid reason to follow up with the prospect. I have countless additional sales tips to offer. But I'd love to hear what works for you. Feel free to post a comment below. Happy selling!